U.S. Rep. Keith Ellison speaks in support of fired Delta baggage handler Kip Hedges (blue coat) during a rally at MSP Airport. Airport workers, union members and U.S. Rep. Keith Ellison today called on Delta Air Lines to reinstate Kip Hedges, a pro-union activist fired just days ago for speaking publicly in favor of a $15 minimum wage at Minneapolis-St. Paul International Airport. About 200 people joined the demonstration outside Termainal 1 at MSP Airport. They shut down the terminal’s Upper Level Roadway before being ordered by police to disperse. Hedges, a baggage handler and 26-year airline employee, told Workday Minnesota that Delta management issued the termination after citing comments he made in a video supporting of the “15 Now” campaign for a higher airport minimum wage. In this video from today’s protest, Hedges recounts what he said about Delta, as his supporters echo his statement. 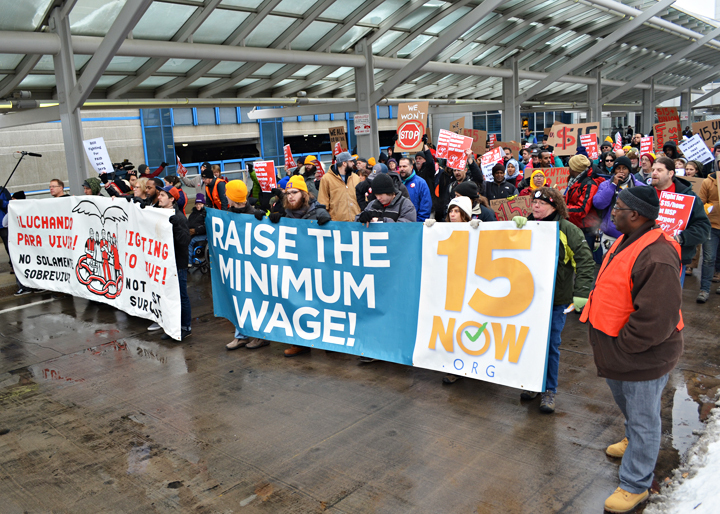 About 200 people joined the march along outside the upper level of Terminal 1, calling for $15 wages and union rights. Meanwhile, passenger-support workers at MSP, employed by contractors like AirServ, said Delta’s effort to silence Hedges would not keep them from working for a $15 minimum wage and a union. Ellison, a DFLer from Minneapolis, called on Delta to reinstate Hedges. He also encouraged passenger-support workers’ to continue their organizing campaign. “We can go a day, a week, a month without the CEO of Delta. We actually don’t need him,” Ellison said. “But you try to go even a short period of time without the cleaners or the drivers or the baggage handlers, and this whole place stops.